In-service inspection qualification needs representative defects to be used in qualification mock-ups. Present defect production techniques have weaknesses, which are not acceptable, such as not representative defects or additional alterations induced in the surrounding material. Hence qualification bodies are still searching for better defect production techniques. It is commonly understood that best representativeness is achieved with realistic defects. A new method has been developed, which enables artificial production of realistic thermal fatigue cracks. This presentation introduces artificially made controlled thermal fatigue cracks. Cracks have been induced without any artificial initiator such as a notch or a precrack and without any preliminary surface treatment. 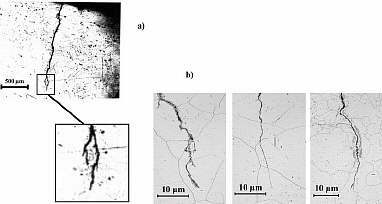 Results of characterisation of cracks with non-destructive ultrasonic methods and destructive metallography are presented. Ultrasonic response as well as metallographic properties of artificial cracks is compared to properties of real, in-service induced cracks. It is shown that artificially produced thermal fatigue cracks compare favourably with the real, in-service induced ones. Realistic cracks are needed for in-service inspection qualification mock-ups. During the operation of a power plant thermal fatigue cracks can initiate and grow in various components. Causes for this are mixing, striping or stratification of hot and cold water (1). These cracks are tight, typically they grow transgranularly and can propagate through the pipe wall (2). During the in-service inspections these cracks create a challenge for ultrasonic inspection. Hence it is commonly understood that real cracks should also be used in in-service inspection qualification mock-ups. Problems with artificial crack incorporation methods have, so far, restricted the usage of realistic cracks in qualification mock-ups. The new method allows controlled production of real cracks in any kind of component. Crack properties affecting the non-destructive examination are among others: location and orientation, microstructural propagation, crack opening/closure and surface roughness (Rz) of the crack and the shape of the crack tip. These parameters affect the detection and sizing of in-service induced cracks. Properties of artificially produced thermal fatigue cracks are in the following compared to corresponding properties of real, in-service induced thermal fatigue cracks and shortly to cracks produced by other defect production techniques. Cracks can occur in nuclear power plant components in different locations such as in straight pipe sections, valve bodies, pipe elbows, collector head screw holes etc., as well as in base material and in weld joints. Crack growth direction depends on the component and the location, based on the local shape effect and the loading conditions. Pipe cracks can grow both axially and circumferentially, in weld joints both parallel to the weld in the HAZ and transverse to the weld cutting it, in threads both vertically and horizontally etc. The new defect production method utilises the same thermal fatigue damage mechanism, which is also active in real components. The method enables defect production in similar locations and directions in which the real cracks occur. Additionally, artificially produced individual thermal fatigue cracks can be produced in any kind of components. There are neither limitation for component shape or size, nor for crack orientation and location. In-service induced cracks have certain microstructural properties, which are affected by the local loading conditions. In Figure 1 a comparison of an in-service induced and an artificially produced thermal fatigue crack is presented. Fig 1: Comparison of cross-sections of a) an in-service induced (2) and b) an artificially produced thermal fatigue crack. The macroscopic propagation of real and artificially produced cracks is similarly tortuous. As shown in Figure 1, both cracks are narrow, propagate transgranularly in the microstructure and show minor branching. The real, in-service induced crack has the largest opening or width near the surface and is tight in the vicinity of the crack tip. Typical crack width of an in-service induced thermal fatigue crack in austenitic stainless steels varies in the surface between 5 and 380 µm, in the middle of the crack between 2 and 190 µm and at the crack tip between 1 and 18 µm (3). The opening of a crack is affected by the condition of the residual stress along the crack depth. Fracture surface of an in-service induced thermal fatigue crack is rough. Typical surface roughness (Rz) values in austenitic stainless steels vary between 6 and 140 µm (3). In Figure 1 the artificially produced thermal fatigue crack has similar opening behaviour than the in-service induced one. Approximate width of artificially produced thermal fatigue crack is at surface 70 µm, in the middle-section 40 µm and at the crack tip 2 µm, respectively. Typical value of surface roughness (Rz) for artificially produced thermal fatigue crack varies between 35 and 125 µm. The tortuous crack path has formed when the crack propagation is changing direction crystallographically in individual grains of the microstructure. In Figure 2 is a comparison of crack tips of an in-service induced and artificially produced thermal fatigue cracks. Fig 2: Comparison of crack tips of a) an in-service induced (3) and b) three artificially produced thermal fatigue cracks. 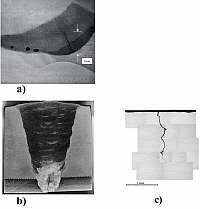 The crack tip of an in-service induced thermal fatigue crack has typically a very small radius and crack surfaces near the tip are close to each other, which is shown in Figure 2. The tip of artificially produced thermal fatigue crack is similarly tight and has a very small radius. 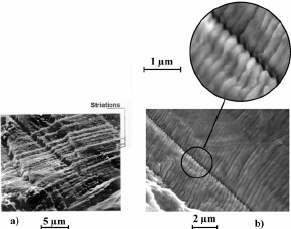 Fatigue crack growth can be followed on the fracture surface by striations. Each striation represents the incremental advance of the crack front. The advance is a result of one loading cycle and the extent of it varies with the stress range. In Figure 3 is a comparison of striations on fracture surfaces of an in-service induced and an artificially produced thermal fatigue crack. Fig 3: Comparison of fracture surfaces of a) an in-service induced (4) and b) an artificially produced thermal fatigue crack. Figure 3 shows, that striations on the fracture surfaces of in-service induced and artificially produced thermal fatigue cracks are quite similarly visible. The incremental crack growth makes it possible to control the artificial crack production accurately. Controlled thermal fatigue cracks can be produced without causing any additional alterations in the surrounding material. As an example Figure 4 compares defects produced with two other qualification defect production techniques and the new artificial thermal fatigue crack production method. Fig 4: Comparison of defects produced with different techniques: a) weld root crack (5), b) surface breaking crack in a weld (6) and c) an artificially produced surface breaking thermal fatigue crack. Figure 4 shows, that the other techniques introduce additional weld metal volume, while controlled production of thermal fatigue cracks results precisely in the wanted crack. During the production of artificial thermal fatigue crack only a small area is thermally loaded while the rest of the material stays free of loading. Artificially produced thermal fatigue crack was characterised with mode-conversion probe (WSY 2MHz), 45° T and 70 °T composite 2MHz probes, ADEPT60 5MHz probe and V110 0°L 5MHz probe. The results were compared to the results obtained with an EDM-notch and a real in-service induced crack. In the Figures 5, 6 and 7 are presented crack tip echoes from EDM-notch, real thermal fatigue crack and artificially produced thermal fatigue crack with 0°L (longitudinal) 5MHz single probe. The crack tip echo is clearly seen from EDM-notch but from the real and artificially produced thermal fatigue cracks the S/N-ratio is very low, being about 6-10 dB. In many cases, where crack tip is under high compression, no crack tip echo can be detected. Often the detection of the crack tip depends on the ultrasonic technique used. In Figure 8 is a crack tip echo shown gained with special probe ADEPT60 from an artificially produced thermal fatigue crack. The same crack tip was seen very clearly with 45° T 2MHz probe. It can be assumed that the crack tip in this case is open. The crack tip was not as clearly detected with 70° T probe as with 45° T probe. With mode conversion probe the signal from the crack varied a lot showing local loss of ultrasonic amplitude. This can be caused by a discontinuous crack propagation or locally affecting compressive stresses. Fig 5: An ultrasonic A-scan of a 13 mm deep EDM-groove (V110 - 0°L). Fig 6: Ultrasonic A-scan of a real, in-service induced crack (V110 - 0°L). Fig 7: Ultrasonic A-scan of an artificial thermal fatigue crack (V110-0°L). Fig 8: A-scan of an artificially produced thermal fatigue crack (ADEPT60). A new controlled qualification defect production method has been developed. The method is based on controlled thermal fatigue damage mechanism. The produced artificial cracks resemble real, in-service induced cracks from the metallurgical and ultrasonic point of view. Metallurgically the produced cracks are narrow, have a rough surface, show minor branching, propagate transgranularly and have a tight crack tip with small radius. The only difference from the real, in-service induced cracks is that the artificial thermal fatigue crack does not have an oxide layer on the fracture surfaces. However, oxide layer can be grown by subsequent heat treatment. Ultrasonic reflectivity is affected by the rough reflection surface and the opening (width) of the crack is small so that it does not give as clear indication as an EDM-notch. The crack tip was detected by several probes and crack tip echo had similar S/N-ratio as gathered from real in-service induced thermal fatigue cracks. A proper echo was detected from the crack tip locally and it seemed that the tip was open and possibly under tension. No additional cracks were detected in the surrounding of the artificially produced thermal fatigue cracks. The produced cracks simulate well the real, in-service induced cracks both metallurgically and ultrasonically. The new method allows also the control of the residual stress condition along the crack length. Thus, the tensile stress at the crack tip can be modified to compression. The method has been applied to different nuclear power plant components: pipes, T-joints of two pipes and collector head samples. Materials have been austenitic stainless steels commonly used in nuclear power plants. So far, practically no limitations have been met for the applicability of the method. The only requirement for the applicability is that the wanted location where the surface breaking crack is aimed to locate must be reachable with the induction heating coil. The main part of the work was carried out at Helsinki University of Technology as a post- graduate work financed by Foundation of Walter Ahlstrצm, Foundation of Runar Bהckstrצm and Technology Development Foundation (TES). The rest of the work has been carried out in Technical Research Centre of Finland (VTT) and Fortum Nuclear Services Ltd.
Y. Hytצnen, “Two Leakages Induced by Thermal Stratification at the Loviisa Power Plant”, Proceedings of NEA/CSNI/R(98)8 Specialists' Meeting, Paris, France, 8-10 June, 1998, pp. 115-160. H. Hהnninen and J. Hakala, “Pipe Failure Caused by Thermal Loading in BWR Water Conditions”, International Journal of Pressure Vessel & Piping, 1981, 9, pp. 445-455. Wוle, J. and Ekstrצm, P., “Crack Characterisation for In-service Inspection Planning”, SKI Projekt 14.4-940389, 94164 SAQ/FoU-Rapport 95/70, SAQ Kontroll AB, Stockholm, Sweden, 1995, 84 p.
Pirson, J. and Roussel, G., “Emergency Core Cooling System Pipe Crack Incident at the Tihange Unit 1 Plant”, Proceedings of NEA/CSNI/R(98)8 Specialists' Meeting, Paris, France, 8-10 June, 1998, pp. 103-114. Doctor, S., Schuster, G. and Simonen, F., “Fabrication Flaws in Reactor Pressure Vessels”, U.S. Nuclear Regulatory Commission Workshop on Flaw Distribution in PVRUF & Structural Integrity Assessment, AL, February 25-26, 1999. Uddcomb Engineering AB, “Testblock med Implanterade Defekter”, Brochure from Uddcomb Engineering, 1999.